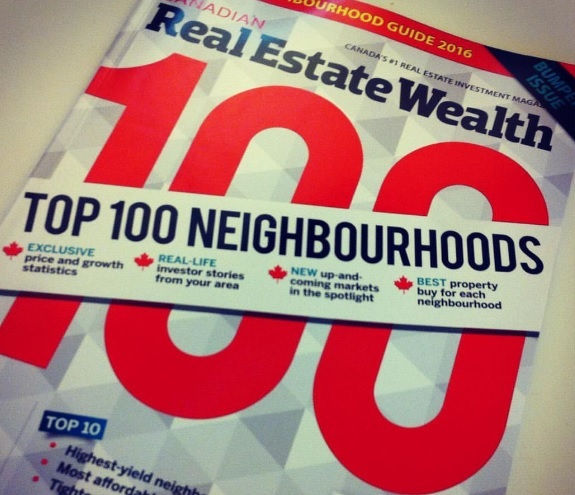 What are Canada’s Top 100 neighbourhoods for investment? The 2016 list of Canada’s Top 100 neighbourhoods for property investors has changed dramatically since last year, as one region saw an economic fall from grace and others saw a significant rise in property prices. “A spike in home prices in markets such as the GTA and BC's Lower Mainland has reshaped this year's Top 100 Neighbourhoods list in surprising ways," says Vernon Clement Jones, editor of Canadian Real Estate Wealth magazine. In the fourth-annual guide, which identifies the specific residential markets expected to lead growth in 2016, Canadian Real Estate Wealth has leveraged exclusive data from The Teranet - National Bank House Price Index(TM) and industry analysis to form definitive rankings on price appreciation, yield and rental values. The results, which are set to hit newsstands today in the magazine's November/December issue, pinpoint the exact locations and property types that investors should consider for both short- and long-term growth. While sought-after neighbourhoods from coast to coast made the Top 100, number crunching and analysis uncovered several surprises that challenge conventional thinking. Small towns and neighbourhoods from St. John's, Nfld. and Stratford, PEI, to Winfield, B.C., and Spruce Grove, Alta., are among them. "The changes we saw this year were surprising in terms of markets entering the Top 100 for the first time," says Jones. "With that much change in the market, it`s even more imperative that we meet our mandate to arm real estate investors with up-to-date neighbourhood-specific information. The Top 100 does that."